Here’s a summary of how Shrek The Musical, now at Pittsburgh CLO, found its way to the stage at the Benedum. In 1990, William Steig published the children’s picture book Shrek! about an ugly green ogre who sets off on a quest to save a princess and discovers he’s beautiful in his own way. In 2001, a whole passel of writers turned it into an animated film produced by the newish Spielberg/Katzenberg/Geffen studio DreamWorks SKG, and it became the first movie to win an Oscar for Best Animated Film. In 2008, composer Jeanine Tesori and book/lyric writer David Lindsay-Abaire opened a musical version on Broadway, which ran for about a year. And now CLO presents the show as part of their summer season. The movie had a welcome strain of sarcasm running through it, leavening the whole “children’s fairytale” thing. Katzenberg, who had earlier been fired from Disney, used the movie to make some quite pointed digs at his old employer and, rumor has it, modeled the villain, Lord Farquaad, on his ex-boss Michael Eisner. 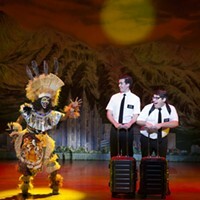 Tesori and Lindsay-Abaire have thankfully kept a lot of that bitchery while also lampooning a number of very famous children’s movies and books; it’s still a kid’s show, but at least you don’t leave feeling like you were dipped head-first into a cotton-candy machine. 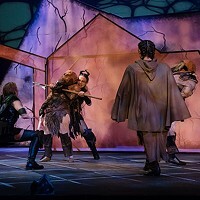 The CLO production features a cast of top-quality performers plowing their way through the material; though enjoyable, I’m not sure we really need to endure 21 musical numbers. Rory Donovan is doing yeoman’s work as Shrek, buried as he is under pounds of makeup, prosthetics and an enormous fat suit. That he manages to create such a touching and humane character inside all that is nothing short of a miracle. Haven Burton plays the princess with a terrifically entertaining blend of schoolgirl romanticism and hard-headed determination. Andre Jordan has all the laughs as Donkey and knows precisely how to hit them to the back of theater. 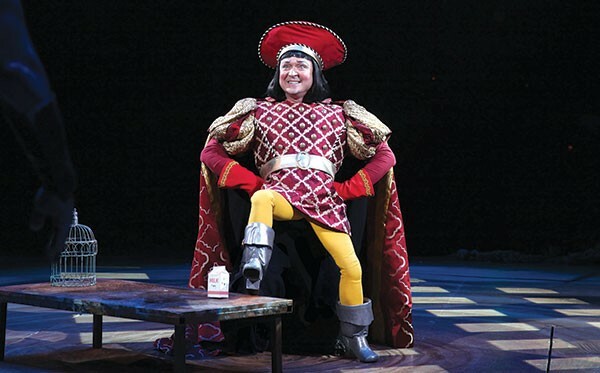 And Benjamin Howes’ Farquaad is a delirious blend of lounge lizard, dizzy diva and showboating egomaniac. I saw the production opening night, and there were technical mishaps aplenty. But by the time you go, it should be smooth sailing indeed.